A great Axis Buck taken on a mid summer archery hunt. We hunted hard and endured the heat but this Great Axis Buck finally gave in to the need for Water and taken at 40 yards. After a quick tracking job we found him piled up and proceeded to take pictures and headed to the skinning rack. 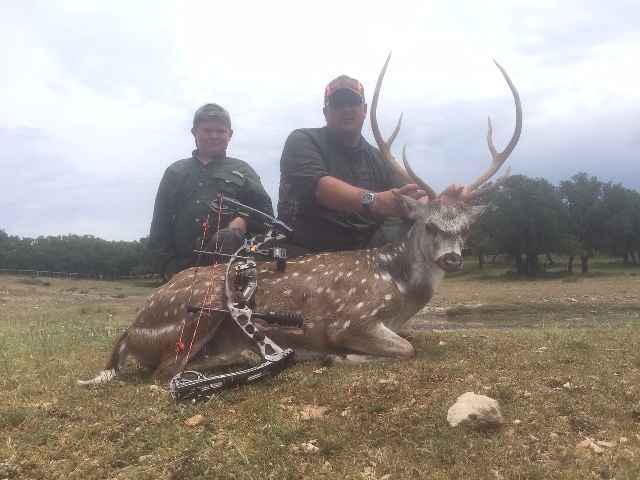 Congrats on a great summer time Axis Archery hunt! 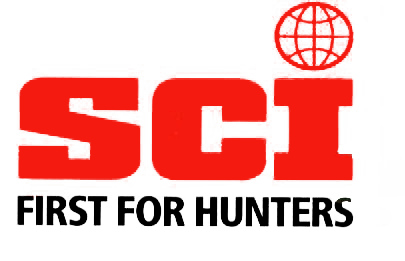 Axis hunting is often times hard enough to pull off with a rifle, When this hunter said lets get one with a bow I knew we had our work cut out for us. We put Bryan in a couple different stands the first couple of hunts knowing we had axis on camera feeding at these locations I knew it would be our best shot. After a couple different sits and seeing tons of different animals the axis where just not going to play our game. Mid morning last full day to hunt we decided to break out the rifle and try to safari style one. We had ran across this buck a couple times and just couldn’t get him to stand long enough to get a shot. After the third time of losing him I knew where he went I told Bryan its a long shot but grab your bow I think we can get behind him and with this wind we might be able to get close enough. We made our way to the cedar and with the rain earlier in the morning I could see tracks leading down to an opening where the fence cornered. I hoped this was where he was headed, I told Bryan to post up on the trees about 40 yards from the fence and I would swing wide and hopefully turn the buck back to him. 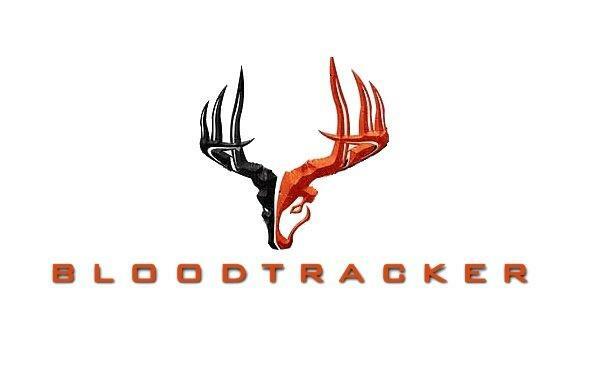 The plan came together when this Trophy Axis broke into the clearing and stopped at 10 yards. Bryan stuck one through the boiler and the rest is history. Congrats Bryan on a great buck! Jason called me back in April and wanted to put together a nice Axis Buck hunt for his wife for her birthday. I told him we could make it happen and should be able to get on a nice Axis Buck. 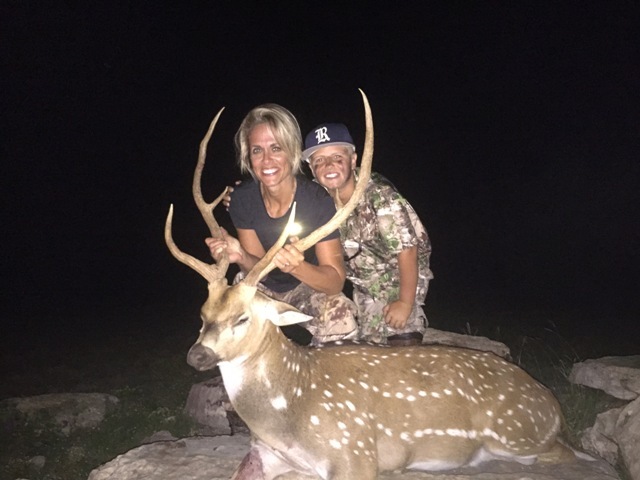 Well the hunt date was upon us and Jason his wife Deanna and son Logan arrived Sunday afternoon to begin Deanna’s Axis Buck hunt. After they settled into the lodge we made a quick trip to the range just to make sure the gun was shooting straight after traveling and I told them be ready around 5 we would make a plan and go sit the first evening. About 5 we started into the pasture Jason had asked about sitting together and if I had a blind big enough that all 3 could just sit together for the first evening. I was a little leery about it but I told them yes we could put them in a blind and just try to be as still and quite as possible. 3 people in 1 popup blind you would be dealing with 3x the scent and 3x the urge to talk and everything so it isn’t the best hunting situation but I told them I had been seeing a lot of good bucks coming through this valley in the evening and I had been feeding there so it should be good. Before we left the lodge we had looked at a bunch of Axis horns and Axis mounts just to make sure they knew what to shoot and what not to. I told Jason if it didn’t look big enough or give you the wow effect when it steps out don’t shoot it we have a few days we want to get a good Axis Buck for her. So as we got to the blind I showed them where I had been seeing Axis Bucks and where they were traveling and yardages and things of that nature and I got them in the blind and headed to sit another location to scout for another spot if we needed to change it up in the morning. Well as it turns out we wouldn’t need to change things up but as I sat and saw probably 10 shooter Axis bucks at my location I started to get the feeling I had put them in the wrong blind. As the sun set behind me and light began to fade I decided to make my way back to pick them up. As I approached they where standing out of the blind so I knew something had gone down. Jason began to explain their evening sit. 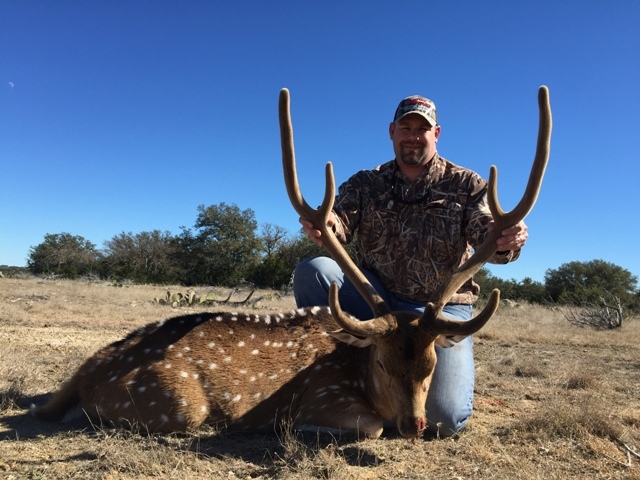 After having aoudad at 20 yards, and blackbuck and mouflon and a huge Axis Buck at about 500 yards this really big Axis Buck came out of nowhere. Jason went on to explain it took a long time for him to come out into an open spot to get get a shot. Giving Deanna plenty of time to get Axis Buck Fever. But once he finally stepped out she got the cross hairs settled on his shoulder and let the .270 do the job. The noticed the Axis Buck kicked hard and ran to the right and got a pretty good mark of where he was when they shot and followed my instructions not to go in after it and risk jumping him. So we started up the ridge with flashlights and started to look for blood. I warned them about snakes and it being prime time for them to be moving and no sooner had the words came out Deanna had a little scare but it ended up being a stick thank God!! So back to the trail we settled on a spot they had visually marked from the blind and we began to look for blood. After about 10 minutes or so I finally found a couple little specs and we started to track. I told them even shooting bigger caliber rifles a lot of times Axis just do not leave good blood trails most of the time and a lot of times you don’t get a pass through on the big bucks. we came to a spot and lost the trail. We circled and looked and looked and finally picked it back up. After about 50-60 yards the blood began to get much better I could see where the big Axis Buck had stopped for a few seconds and dumped a big puddle of blood so I knew he wouldn’t be to much further. We worked the trail around another clump of trees and I shined up ahead and could see white belly in the distance in a big cedar thicket. The excitement began we all raced up to the deer and Deanna was so excited to have her first Big Axis Buck down. We shared some high 5’s and got him set up for a picture. This Axis deer was a toad big body swollen neck and big horns. Congrats Deanna on a fantastic Axis buck and a great hunting trip. 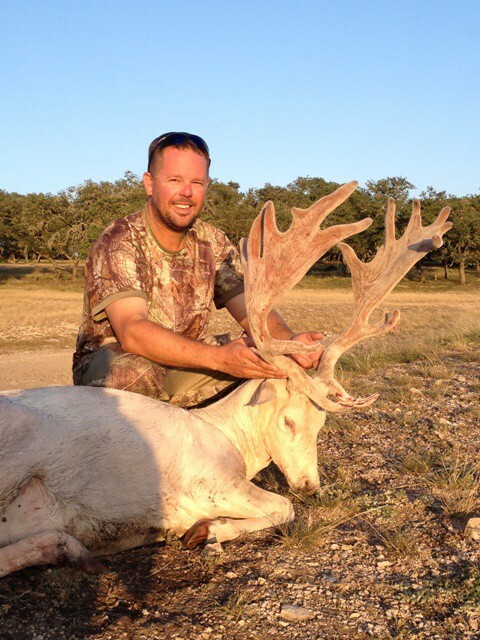 Can’t wait to have Jason and the family back at the ranch for another great hunt with Forister Exotics. After Ryan got his Fallow down we decided to look around and see if we could find something else to shoot. I told the guys we where seeing some good Axis bucks feeding midday. We made our way over to the pasture I had been seeing this Axis buck and after a ride through not seeing anything I decided to feed the runway and sit and watch it for a little while. After a few minutes we had probably 10 different Axis bucks feeding at 200 yards and various other species working in and out of the area feeding. We waited knowing a bigger Axis buck was bound to make his way out. out of nowhere we look up and this monster Axis buck is walking in. We tried to position for a shot knowing Ryan’s Rifle was good to 400 yards we didn’t feel like we needed to get closer just needed to get the right shot. Like big bucks of all species seem to do the Big Axis Buck just knew it was time to go. He made his way across the strip like he was moving to the closer corn then veered off to the brush never giving Ryan a clear shot. We waited a minute to see if the Axis Buck would come back out. Time to make a move and see if we can find the Axis Buck. As we made our way up deer began to run around confused and one big Axis buck went right in the same direction the Axis buck we where after left. About then the big Axis buck ran out right in front of us and turned and ran up the runway from us. Ryan was still locked in on second buck that had weak top tines. I quickly turned the truck sideways and Told Ryan the one on the left broadside. The Axis Buck had run up about 100 yards turned broadside and stopped to look back. Ryan quickly acquired the correct target and with one shot the Axis buck never took another step. 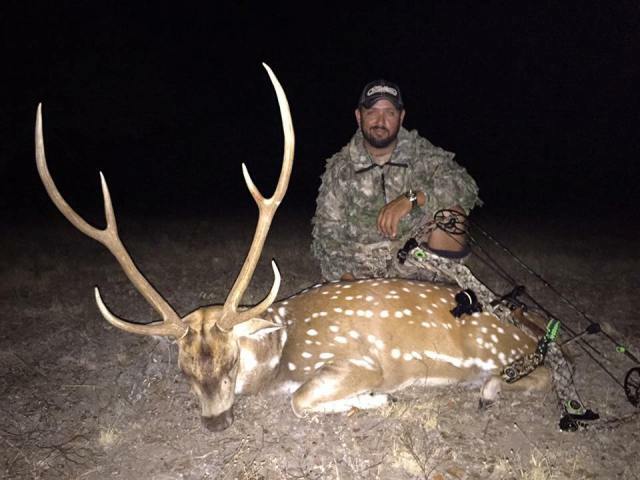 Congrats Ryan on your trophy Axis Buck and another great hunt at Forister Exotics! 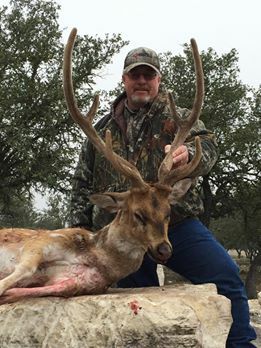 Dave had come to Texas with Dave and George and wanted to take a nice Axis Buck. I had been seeing a couple Axis Bucks that where hard horned and a couple Axis Bucks in Velvet. So we sat Dave in a popup blind over a watering hole and feed location. It took a couple of days of playing cat and mouse and seeing the big Velvet Axis buck skirt the stand and not give Dave a shot but the same night George got his whitetail The big Velvet horned Axis Buck made his way into the feed and Dave made a good shot and had an Awesome Axis Buck down. Congrats Dave on an excellent Axis Buck. July Axis in The Heat!! 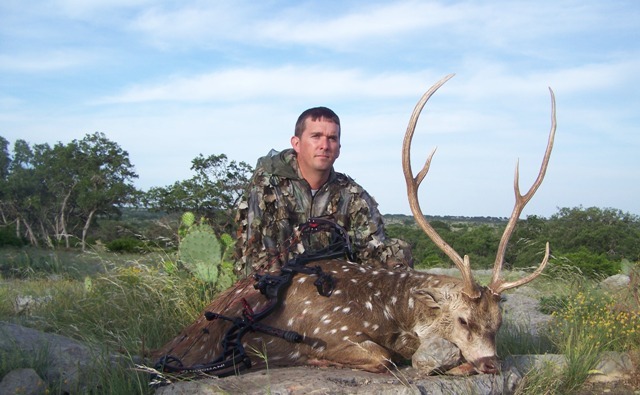 On a trip in July we had Dan braving the heat with his bow on a Trophy Axis Buck Hunt. We started the hunt off keying on brush where the Axis Deer have been traveling close to a water source. After seeing some nice Axis Bucks we decided to place a second stand closer to the travel route as the Axis Bucks kept skirting the set up. First set in the new stand and this Axis buck came in to 25 yards and Dan let him have it! Congrats Dan on a great axis with the bow. Keith and Joe made their way from east Texas to the ranch Thursday night. Keith was wanting to get a fallow buck or two or one of each color if possible and Joe wanted an Axis buck. No easy task for hunters with the stick and string. Well we planned to give it our best shot and after 2 full days of hunting I can say we did that for sure. The first morning I sat Joe and Keith in stands hoping they might catch a trophy coming to a feeder. After dropping Keith off I took Joe back to a tripod in the brush knowing a big axis buck was traveling through the area on a regular basis. As we turned a corner we saw a big Axis buck pretty close to the stand so I felt good for Joe’s chances. Around 9 am I went and picked them up, neither hunter had seen the deer they where after. We decided to drive around and see if we could spot and stalk on one of their trophy bucks. After a lap through the pasture we were coming back toward the house and we spotted 4 Fallow Bucks standing along a cedar break. As we got close in the truck I knew they were going to stand still long enough to get a shot. I stopped Keith got a range on them at 45 yards I told him the Chocolate Fallow Buck in the middle standing broadside was the one he wanted as he stepped out of the truck. Keith brought his bow to full draw and I backed the truck up giving him a clear 45 yard shot on the Trophy Chocolate Fallow Buck. I was watching through the binoculars when he let the arrow fly and I could tell right away something went way wrong either mechanically with the bow or with the release. The arrow went way off course to the right and the 4 fallow bucks had seen enough and bolted for the brush. Now to figure out what went wrong? We quickly learned that there was something wrong between the setup of Keith’s arrow rest or the broadhead he was shooting. When he would draw the arrow was a hair short and the boadhead hit the rest. So we quickly made a change and hoped the equipment problem was fixed. After lunch we were back at it but we decided to head to the other ranch in search of Fallow bucks that where not informed of our intentions. After driving around for a while and walking and trying to find the big Fallow bucks we finally had them but they were in a bad spot. It was to open to advance on foot so I wanted to try to get down the hill and work back up through the brush to them. As we pulled away the Fallow Bucks must have ran and found a rock to crawl under because we were not able to locate them again in that pasture the rest of the hunt. I decided the best chance was probably to head into another pasture we hadn’t hunted yet and stand hunt till dark. At dark I picked up the two hunters and both saw a ton of game just not the right one presented them with a shot. Saturday morning found the hunters back on stand and both saw multiple animals just could not close the deal. We hunted most of the day looking for a chance to put a stalk on one of their Trophies but never could make it happen with a bow. The hunt was winding down and I knew we had one sit left Saturday evening and then the guys needed to get on the road headed home. I wanted to put Joe in a stand watching a water hole and as we approached multiple shooter Axis Bucks were there already. They never spooked and ran off they just walked into the draw. After we dropped Joe off and fed a little corn we pulled away and I could still see the Axis Bucks in the draw. On the way to Keith’s stand we spotted a very nice white fallow buck and I knew he was in a good spot to put a stalk on him. Keith was ready and we made a plan and started in on the stalk. As Keith made the final approach the Fallow buck stood up at about 25 yards and presented Keith with a shot. Keith came to full draw and let it rip. I watched through the binoculars as blood pored from the massive hole the broadhead left as it passed through this Fallow buck. I knew he hadn’t gone far. So after a little celebration and a short tracking job we were headed to take pictures and hopefully get Keith on stand for the last hour or two of the day hoping he might get a crack at another Fallow Buck. As the sun set I went and picked the hunters back up and the big Axis bucks never came back to the water hole and Keith didn’t get to fire another arrow. With some skinning to do and everyone ready to eat we headed back to the lodge. What a nice fallow buck for the first one of the season. Congrats Keith on a great hunt hope to have you guys back to finish out the fallow slam and get Joe an Axis buck later this fall.